Led Zeppelin spent 2014 reissuing their catalogue in expanded form, and the campaign continues into 2015 with the double album Physical Graffiti. The reissue will be out on February 24, which is 40 years to the day since its original release in 1975. 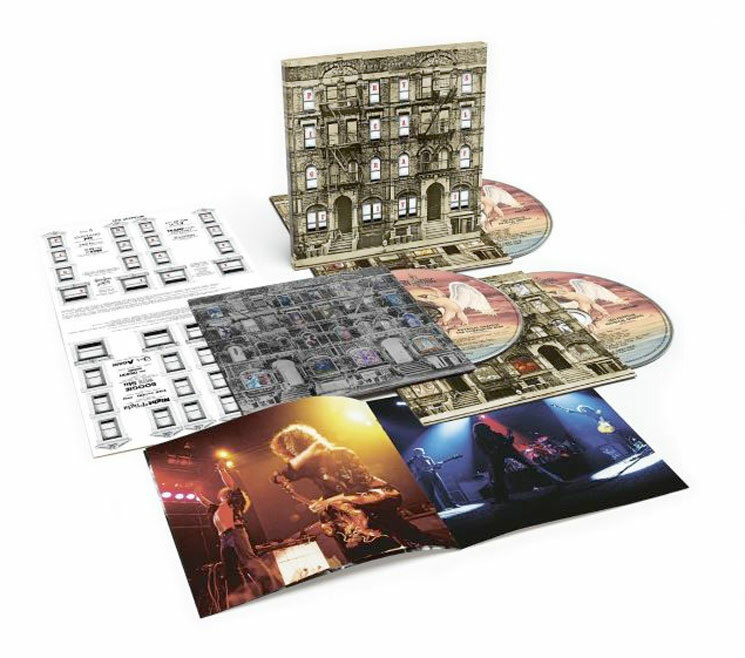 As with all of the recent Led Zep reissues, Physical Graffiti was remastered by the band's own Jimmy Page and comes with an extra disc of previously unreleased tracks. This album will be available in various forms, including standard double CD (in a vinyl replica sleeve), deluxe triple CD, standard double LP (in a sleeve that replicates the original), deluxe triple LP, digital download, or deluxe box set. The boxed version includes all of the CDs and LPs plus a download card, 96-page photo book, and a print of the original album cover (with the first 30,000 numbered). The bonus audio included in the deluxe versions consists of seven unheard tracks. There are a number of alternate mixes, plus a rough orchestra mix of "Kashmir" called "Driving Through Kashmir." There's also what a press release calls a "strikingly different" early version of "In the Light" with different lyrics entitled "Everybody Makes It Through." See the tracklist below, as well as learn more about each edition and pre-order the set here.